No, we know Turf is not in Topsham. But the Turf Locks pub has been intrinsically linked to our town both historically as well as emotionally for so long that many of us feel that it is almost an extension of Topsham. 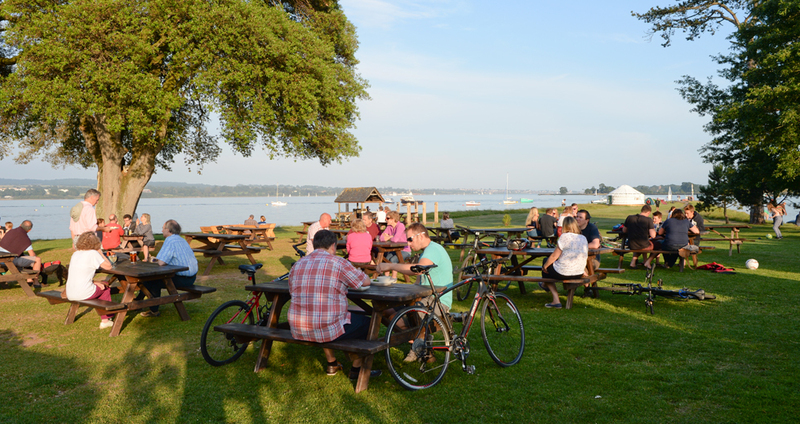 It’s the place we sail, canoe or paddleboard to; or else we catch the Topsham-Turf ferry that takes locals and visitors alike on a lovely, meandering river cruise to this unique pub at the entrance to the Exeter ship canal; or we can cycle around via the Route 2 cycle route and Exeter swing bridge; or catch the small ferry from near the Passage Inn across the Exe for a pleasant stroll down to this waterside inn. Turf may not be in Topsham, but many of us here certainly consider it a Topsham pub. Clive and Ginny Redfern have been running Turf since 1990. This is a proper pub. There are no carpets, just pine strip floors which are ideal for muddy paws and muddy kids. Both are very welcome. Turf’s position, away from roads and access by car, means that its opening hours can vary through the seasons, days of the week and weather. 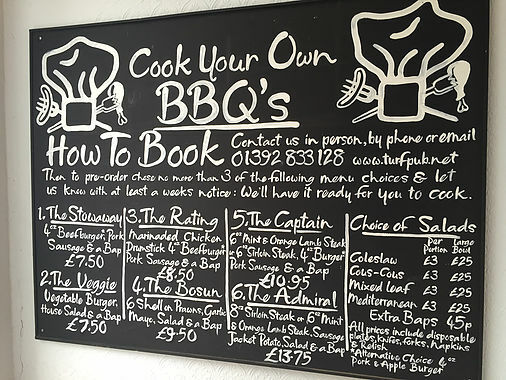 Availability of food is also variable, from coffee and cakes from the Turf Hutch, to a lunch menu that includes local crab and salmon sandwiches as well as hot foods, to a full evening menu in season prepared with skill and precision (essential to book). On Bank Holidays and weekends, in fine weather, Turf can be incredibly crowded; at such times, food is available from the outdoor bar area. It is also possible to arrange cook-yourself barbeques to enjoy in Turf’s beautiful estuary-side grounds. Foods are all sourced locally and make the best use of Devon produce. Clive equally prides himself on the quality and provenance of drink, so local beers and ciders feature, there is a gin list, and the wines are both excellent and keenly priced (look out for the special Landlord’s selection – these are the wines that Clive himself loves drinking the most). Historical footnote: The River Exe was navigable from the sea up to Exeter until the 13th century. At that time, the formidable Isabella de Fortibus, Countess of Devon, built a weir across the river, cutting off Exeter’s port from the sea. Though trade with Exeter’s port was later restored, Hugh de Courtenay, 9th Earl of Devon (and Isabella’s cousin), further blocked the river in 1317 and had Topsham Quay built. Boats were forced to unload at Topsham, and the Earl and his descendants could exact large tolls to transport goods to Exeter. This situation prevailed for some 250 years until 1563 when Exeter traders commissioned the construction of a canal to bypass the weirs and rejoin the River Exe in Exeter’s city centre. The lower part of the canal was extended to its mouth at Turf Lock in 1677 and the canal was deepened and widened to allow the passage of ocean-going ships. So it is probable to assume that Topsham people have been drinking at Turf for more than 300 years.